Pope Benedict XVI was troubled by "some great challenges" during his time in office -- including allegations of corruption within the church that were illegally exposed by his former butler and his relationship with a controversial Catholic brotherhood -- the pontiff’s brother said Tuesday. Speaking to reporters in Germany, Georg Ratzinger said the pope was “doing relatively well” and his announcement Monday that he was going to stand down had not had an effect on his health. 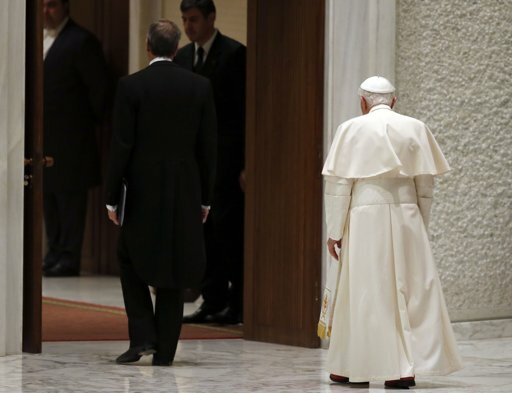 Ratzinger said the pope’s time in office had “created great challenges for him,” highlighting two particular issues that concerned his brother. "Within the church a lot of things happened, which brought up troubles, for example the relationship to the Pius Brotherhood or the irregularities within the Vatican, where the butler had let known indiscretions,” he said. “These were emotional years, but with God's help and his own commitment, I think he mastered it rather well,” he added. Ratzinger did not specify the pope’s issues with the Pius Brotherhood, or Society of St. Pius X as the group is formally known. In October, the pope’s former butler Paolo Gabriele was given an 18-month prison sentence in the so-called “Vatileaks” case, after he was found guilty of stealing thousands of Vatican documents -- including some of Benedict’s private papers and letters alleging corruption within the church -- while working for the pontiff. Some of papers were leaked to the media and, in court, Gabriele said he acted out of concern for the church and the pope. The pope pardoned Gabriele just before Christmas.